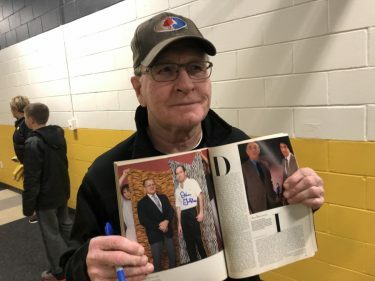 WATERLOO, Iowa—The National Wrestling Hall of Fame Dan Gable Museum is celebrating the holidays with five special auctions featuring rare and unique Dan Gable items. Inducted into the National Wrestling Hall of Fame as a Distinguished Member in 1980, Gable is arguably the greatest athlete and coach ever. In 1972 won a gold medal at the Munich Olympics without surrendering a point. As the head coach at the University of Iowa he led the Hawkeyes to 15 NCAA team titles in 21 years, compiling a 355-21-5 dual meet record. All proceeds from the auctions benefit the National Wrestling Hall of Fame Dan Gable Museum, a non-profit organization committed to advancing the sport of wrestling. Contact the National Wrestling Hall of Fame Dan Gable Museum at (319) 233-0745 or dgmstaff@nwhof.org with questions about the items. For all you nostalgia buffs out there, this poster is for you. Remember “Dan Gable: Competitor Supreme”—the fast-paced wrestling documentary featuring the Iowa wrestling team in action? Well, we do. This vintage poster is signed by ALL of the iconic wrestlers featured in the documentary, including Dan Gable, the Brands twins, the Steiner twins, Tom Ryan—and more. To bid on the poster, click here. Iowa has been—and always will be—the State of Wrestling! This one-of-a-kind 24” x 36” poster celebrates Iowa’s rich wrestling tradition with coaching legends 10 Iowa coaching legends. Everyone featured on the poster with the exception of Mike Duroe, who passed away shortly after the poster was created, has signed this poster. Dan Gable, one of Duroe’s best friends, signed the poster by Duroe’s image with a special note. To bid on this poster, click here. Only 100 of the alternate edition Dan Gable action figures were created. This one—number 72/100—is the only one numbered in gold. To bid on the action figure, click here. This signed magazine is so rare that Dan Gable didn’t remember being featured in it. Gable was highlighted in the June 1984 edition of “Gentleman’s Quarterly” with his college wrestling coach, Harold Nichols, of Iowa State. To bid on the magazine, click here. There were two rules when Single Speed Brewery (based out of Gable’s hometown of Waterloo, Iowa) crafted the new Gable Munich Helles Lager: it had to be good and had to be gold. This is the original (and only) print template when Single Speed Brewery created the can for the lager. We’ve also thrown in the first empty can pulled off the line for the Gable Museum. To bid on this item, click here.